Concentrated and durable comb is made of stainless steel, dull teeth to prevent your pet getting hurt, great for all haired pets need shedding: dogs, cats, rabbits, etc., effectively lessen the loose hair, dead hair. It will be helpful to brush your pet once or twice a week, 15-20 minutes a session. For the health of your family and pet, it's recommended to brush on schedule, reducing up to 90% shedding and hair knot. Minimize shedding in such a short time, so you don't have to worry about unsightly hair or fur all over your house, bed, furniture or car, reducing the possibility and likelihood of allergic reactions. 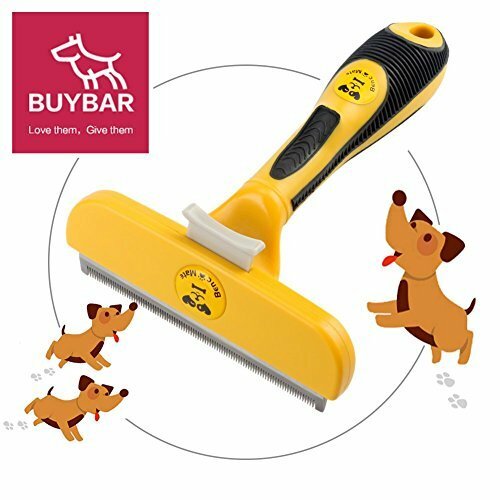 4-inch effectively stainless steal comb, Layers and layers just brushed off your dogs or cats easily, you will ecstatic with happiness with this brush and your lovely pet will be indulged in it. The protective cover is for comb protection during shipment, not for daily use. If you notice any redness or irritation of your pet's skin, immediately stop using the tool and ask your vet for help. Use a lot of force may scratch and cause pain so please use this with care. It's advised to use this tool in small amounts at the beginning and slowly increasing the area being covered to ensure the most positive experience for your pets. If you have any questions about this product by BUYBAR, contact us by completing and submitting the form below. If you are looking for a specif part number, please include it with your message.